In pioneer times, a lone soldier has been left to defend a fort, and now it's under attack! Deflect the flaming torches of the natives using your trusty hammer. 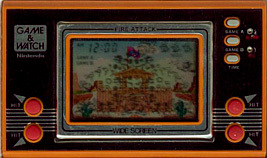 The two natives at the top of the screen throw flaming torches, while the attackers at the bottom climb up ladders and try to set fire to the fort. Move the soldier to the corners and swing the mallet to deflect the attacks. You score 2 points for every attack you deflect. If you have no misses at 200 or 500 points then Chance Time begins, where for 30-50 seconds all enemy attacks deflected will be worth 5 points. Natives attack from three corners of the screen. When you get a miss, the corners they attack from change around. Natives attack from all four corners of the screen, and the attacking speed is faster.